I’ve been working with two of our Asian country offices this week – Vietnam and Indonesia – helping them focus their programmes on low-carbon and climate-resilient growth. Travelling back and forth to the offices, I’ve noticed some sharp contrasts between the two’s capital cities. Hanoi is full of hundreds of motorcycles, whizzing about and jam-parked on what would otherwise be normal pavements. Jakarta is just as congested, though its roads are significantly wider, and more Mercedes cars feature in addition to the motorbikes. Globally, road transport accounted for 10% of greenhouse emissions in 2000 and the sector has grown since. So I’ve asked some of the DFID staff, as well as other ordinary city-dwellers, what they think the scope is for low-carbon transport, such as electric vehicles? 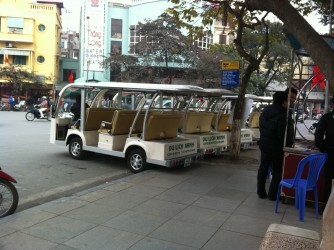 Can low-carbon transport in Vietnam go any further than this? I’m told that Singapore is probably the best place in the region to experiment with this. Singapore has a well structured traffic-control system, more complex than London’s congestion charge, where traffic is even redirected if there are too many cars in one area. There, the government could bring in a two-tier pricing system – so that electric or hybrid cars pay considerably lower prices to enter the central business district and other car types pay considerably more. Singapore could be the “prototype” low-carbon transport state, by providing strong economic incentives to move from gas guzzlers to sleek electric cars…right? Maybe…but I was reminded that economics isn’t everything (at first glance anyway), status matters. In Hanoi, those who don’t have their own transport want to graduate to motorbikes, motorbike owners want to graduate to ordinary cars, and ordinary car owners want to graduate to “status” vehicles (which many refer to as gas guzzlers). Low-carbon vehicles, and for that matter, public transport such as buses and rail, simply don’t cut it. They are either too dirty, too full, too impersonal, or nowhere near as “good-looking” as the graduated forms of transport. In addition, bringing them in requires upfront infrastructure investment or changes to land that belongs to ordinary families or businesses – how will they be compensated, if at all? And even if governments managed to create innovative public-private partnerships to overcome these investment problems, could economic policies – like two-tier pricing – really make a dent on people’s real aspirations? Anecdotally I think it might, particularly if combined with other measures. I have friends who see new hybrid cars as “status” vehicles simply because of their relative expense. I personally prefer to get the train between Glasgow and London rather than drive because of the opportunities being on a train affords. Free Wi-Fi and quiet carriages mean I can read, watch new podcasts or get some work done. These small “comfort touches” matter. And, as someone who knows about the economic cost of carbon emissions, I know I have a responsibility to do my best to travel in as low-carbon a way as possible. It’s this last knowledge factor that still seems to be missing from many policy discussions. On my “Air Asia” (Asia’s answer to Easy Jet) transfer between Hanoi and Jakarta**, I watched a TED talk about oil by Lisa Margonelli, who suggests adding warnings about the negative effects of oil to petrol receipts or vehicle purchases, much like cigarette packs have their warnings and pictures of tobacco’s grim effects on health. Such knowledge tools, if combined with a range of other direct economic incentives such as new infrastructure investments and extra “comfort” measures for public forms of transport, may well help motorbike owners aspire to sleek low-carbon travel. Perhaps – it’s a journey we certainly should attempt to make. On that journey, we should probably check out this new, startlingly relevant book about Asia’s potential effects on the planet – it’s on my reading list this week!